He inherited the role after the departure of guitarist G.E. Smith from the tour in the early '90s. In fact, Smith was the person who hooked Garnier up with the job after the illness of bassist Kenny Aaronson. Smith and Garnier had played together in the house band on Saturday Night Live. Before that, Garnier -- who was born in Minnesota and raised in California -- did time as the bassist for country-swingers Asleep At the Wheel as well as gigs backing Tom Waits, Robert Gordon, Buster Poindexter (a.k.a. David Johansen of New York Dolls fame) Albert Collins and Otis Rush. Garnier's role besides being the bandleader, is to underpin the three-guitar assault of Dylan, Campbell and guitarist Charlie Sexton (and formerly pedal steel/mandolin player Bucky Baxter). Garnier's basslines tie the musical arrangements together. His understated and flexible style allows the ensemble to make the leap from slow blues shuffles to sprite bluegrass passages all the way to the pulsing, hard rock crunch of "Silvio." Using both an electric bass and a stand-up "doghouse" bass for the acoustic numbers, Garnier gives each groove the swing and depth necessary, propelling the melody forward. "That's the trick," Garnier said in Bass Player magazine in 1997, "listening to the groove and listening to the singer. It's really hard. Sometimes you might tune in to the vocal a little more; other times you need to set up a good groove so the singer has something to sing to. That's what makes performing live so exciting." "Bob's songs are based on music I've played through-out my life," Garnier said. "but the best way to learn them is to know the lyrics. Once you do that, you see how powerful his music is. I can be onstage playing something we've performed hundreds of times, and I still get emotional hearing it." 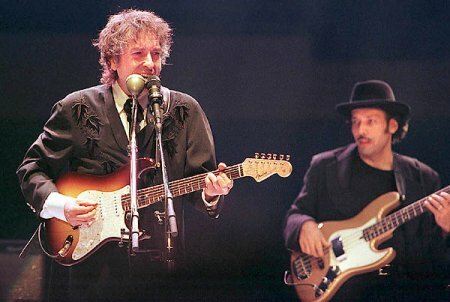 Garnier's other distinction is that he has played longer with Dylan than any other musician. His association with him dates almost to the beginning of the Never Ending Tour and it seems plausible that Garnier's continued presence has kept Dylan on the road as long as it has. Garnier said, "Playing with Bob takes precedence over everything else."